SSA/keyboard/optional viola. A song of Thanksgiving and faith in God. Text adapted from the Psalms. Lyric and simple, and appropriate for middle school choir. Medium voice solo/SATB/keyboard. A lovely setting of the well-known love song by the Israeli composer, Joseph Hadar. Unlike other arrangements in which the mood of tenderness is unvaried, this arrangement incorporates a moment of passionate desire which gives another dimension to the romantic sentiment. 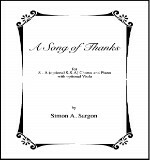 Baritone solo/SATB/organ. Four texts of various poets. Although written with AIDS in mind, the texts utilized are universal in scope, yet each deals with the subject of death from a different vantage point. The organ sonority lends drama while the chorus expresses the unrelenting feelings of loss. Individually or as a group, these songs make a powerful statement and are appropriate not just in a concert setting, but for a funeral or memorial service as well. Baritone solo/SATB/piano. An arrangement of the powerful third movement of Sargon's Symphony No. 1- Holocaust. High voice solo/SATB/keyboard. A rhythmically energetic and upbeat piece with intriguing use of mixed meters. The antiphonal effect between soloist and adult choir is enjoyable for both singers and listeners. High voice solo/SATB/keyboard. The soloist's opening song of confident faith is interrupted by an agitated middle section which deals with doubt and suffering. However, the opening returns and, in a delightfully echoing passage, the soloist reiterates her unshaken faith. Bass solo/SATB/keyboard. A heart-felt prayer for the city of Jerusalem, holy to so many faiths. Particularly suited for Yom Yerushalyim ("The Day of Jerusalem"). It is equally appropriate for Yom Ha'atzmaut (Israel Independence Day), or any program celebrating the land of Israel.